The Quick Ray Master UATM-272B is a newly developed tissue microarrayer running by simply connecting to user's computer through USB port. The instrument is running with the unique UNITMA S/W based on Window7 of user's PC. The changeable tips for the desired core size of the recipient blocks has 4 different sizes which are 1mm(120 holes), 1.5mm(90 holes), 2mm(60 holes), and 3mm(30 holes). UATM-272B is designed to be smarter than UATM-272A but it is very easy for users to be familiar with the instrument. Quick Ray Master helps the researchers to decrease the time and labor in creating the blocks by using the pre-made recipient blocks to be supplied by Unitma. Premade recipient blocks as consumables are purchasable from Unitma. The Automated Tissue Microarrayer is an instrument which can pick up the sample tissue from the donor blocks and insert the sample into the correspondant hole of the premade recipient block automatically. The computer aided Quick Ray Master(UATM-272A) is the integrated tissue microarrayer running by Windows XP and operating by the touch screen with LCD monitor, and is also connected to the external monitors, USB keyboard and USB mouse. Also, the quick help function key is available for various tips including instructions on saving image files and reporting the information of recipient blocks through an external USB memory and an external PC with LAN interface. 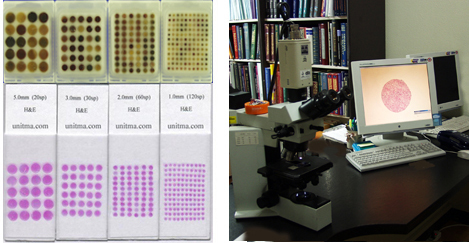 Quick Ray Master helps the researchers to decrease the time and labor in creating the blocks by using the pre-made recipient blocks to be supplied by Unitma. A function of the rotary typed tip module consisting of 3 tips sized 1mm,2mm and 3mm offer the automatic change of the desired tip by using the software as the researchers' option. 1. 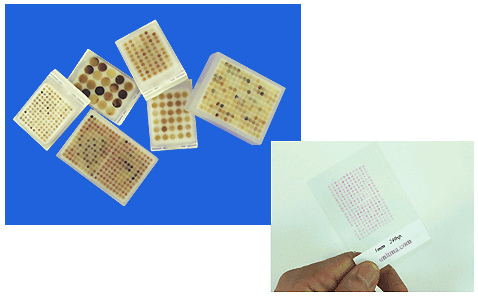 Place the reference slide and the donor block on microscope stage for position marking with an oil pen. 3. Extract the marked tissue from the donor block and deliver the extracted tissue into the corresponding holes of the pre-made recipient block (UB06) by using UATM-272. 4. Put the recipient block into embedding mold with cutting section faced down and incubate it in Oven at 60ⅹC for 30 minutes. 5. Take out the recipient block when completely transparent. Embedding with paraffin. 6. Solidify the block in cold plate.